There is no denying that if your business website cannot be found using Google or the other search engines; you will start to lose sales to your competitors. With mobile search, the field has exploded. With more people using smartphones to access the internet, it is now ultra important to ensure your website is mobile friendly. These statistics from ComScore show the changing nature of web browsing. 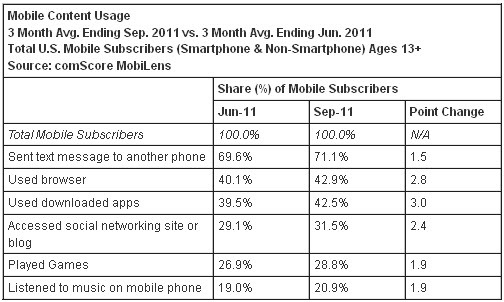 Although these statistics are for the U.S., about 57% of all mobile purchases are for smartphones. (ref: IDC Telecommunications) Considering there are now about 26 million mobile phones in Australia, the number of people accessing the Web is believed to be in a similar range to the U.S. So really what does it all mean for your business? According to Matt Cutts from Google, mobile friendly sites are going to be important to search engine rankings. If Google sees that a lot of people are accessing your mobile site and they are not staying because the content is not relevant or easy to navigate and are COMING RIGHT BACK to Google, it will assign a negative bounce rate to your site. And this could hurt your mobile search engine ranking. Google have said their rankings for desktops compared to mobile devices are different. You might think that doesn’t matter if most people are using their desktop computers to find my business. It may not matter to you right now but it will matter to your business over the next 12 months With at least 12 million mobile capable web devices in Australia searching Google regularly, the ability to find your business wherever they are has never been easier. And at the time when they are ready to buy! Its time to go and make mobile search part of your online marketing and discover the great benefits it will bring to your business. Call us today so we can show you how your website appears on smartphones. The results may surprise you.